Most Sundays we gather for our "Quiet Start" worship at 9am, with communion served by intinction ("dipping") and "Full House" worship at 11am, with choir, children's circle, and communion served in trays. There is "Worship & Wonder" time for all children and child care for the very youngest during both services. 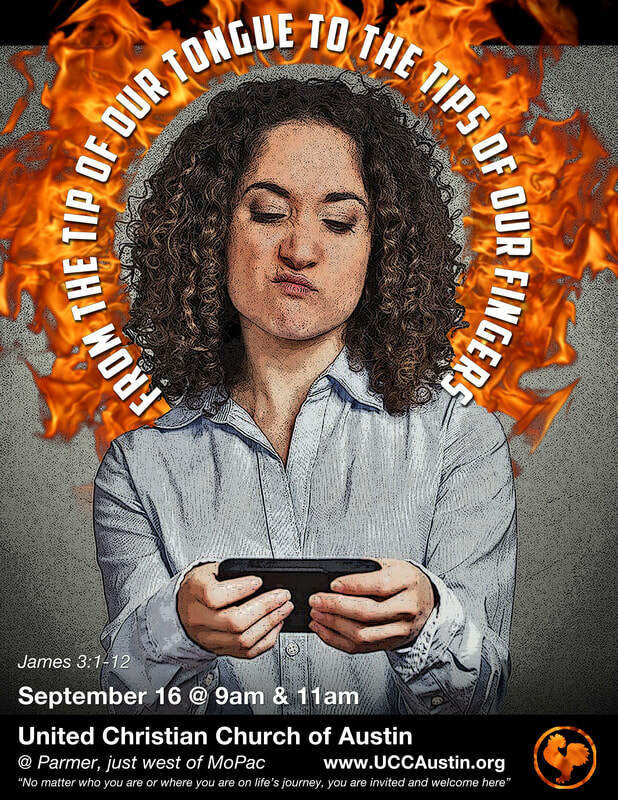 Sermon: "From the Tip of Our Tongue to the Tips of Our Fingers"
The Epistle of James warns against the power of the tongue to "set the world on fire." But that power, for good or for ill, has taken a quantum leap forward today with the power of the internet. How can we hope to bridle this horse once it's out of the barn? James 3:1-12 Not many of you should become teachers, my brothers and sisters, for you know that we who teach will be judged with greater strictness. For all of us make many mistakes. Anyone who makes no mistakes in speaking is perfect, able to keep the whole body in check with a bridle. If we put bits into the mouths of horses to make them obey us, we guide their whole bodies. Or look at ships: though they are so large that it takes strong winds to drive them, yet they are guided by a very small rudder wherever the will of the pilot directs. So also the tongue is a small member, yet it boasts of great exploits. How great a forest is set ablaze by a small fire! And the tongue is a fire. The tongue is placed among our members as a world of iniquity; it stains the whole body, sets on fire the cycle of nature, and is itself set on fire by hell. For every species of beast and bird, of reptile and sea creature, can be tamed and has been tamed by the human species, but no one can tame the tongue—a restless evil, full of deadly poison. With it we bless the Lord and Father, and with it we curse those who are made in the likeness of God. From the same mouth come blessing and cursing. My brothers and sisters, this ought not to be so. Does a spring pour forth from the same opening both fresh and brackish water? Can a fig tree, my brothers and sisters, yield olives, or a grapevine figs? No more can salt water yield fresh. 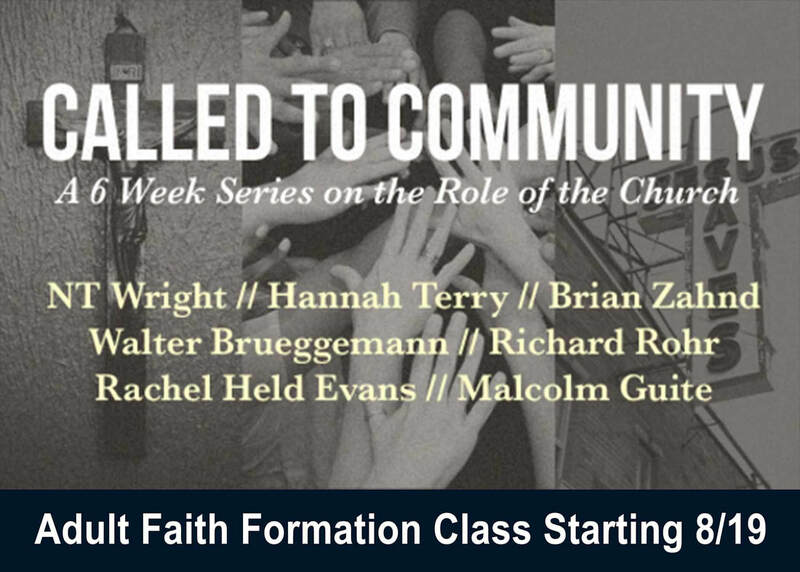 In the midst of these radical shifts in our society and within Christianity itself, it is clearly time to revisit the question, "What is the role of the Church?" What is the Church’s role in the lives of individuals and families who no longer turn to it as the center of their social and family structure? ...in a world that increasingly sees it as irrelevant or even antithetical to human progress? ...in the lives of the people who continue to return to it as a source of strength, inspiration, solace, and connection with God? …in the lives of the people who have never walked through one of our doors an those who have sworn they never will again?" Session #5, September 16: "A Call to Be the Body of Christ"